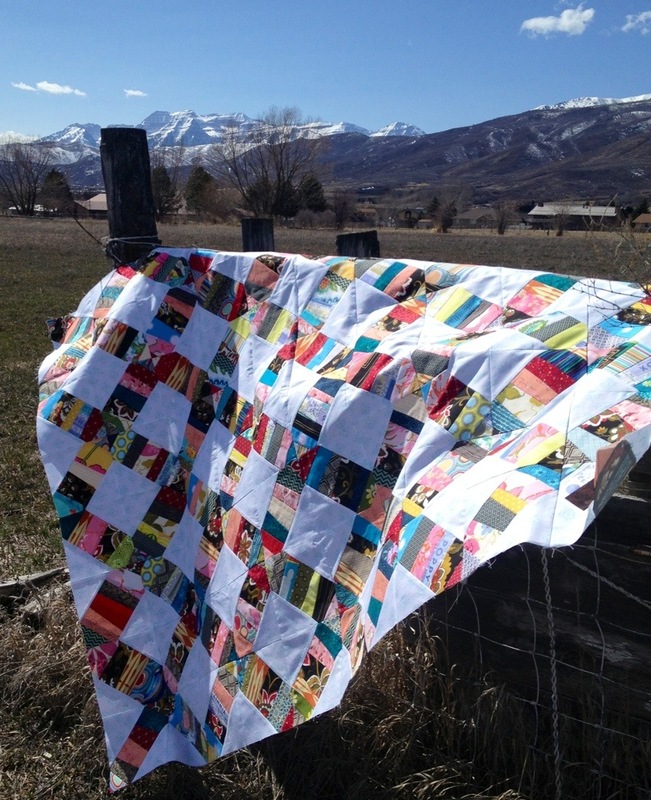 Here is my fabric interpretation of the painting ‘Big Rock Candy Mountain’ by Colt Bowden. We’ve been locked into an artist trade for years and I’m finally coming through on my end of the bargain. Here is the original painting and inspiration- Big Rock Candy Mountain by Colt Bowden, painted for Summit in Eden Utah. In case you’re not aware, Summit is a residential artists community designed with the vision of creating an epicenter of innovation in the heart of the Wasatch Mountains. It’s been a very experimental and frustrating piecing process, in quilt piecing triangles, I’ve been making it up as I go along. But like any challenge, if you keep working at it, it becomes easier as you go and hopefully you learn something along the way. Here is the mountain, finally all pieced, with a faint chalk outline of where to cut out for the final mountain shape. It’s about 5 feet tall and 34 inches wide at the bottom. You can see the freestyle, experimental piecework from the back, some seams match and have a small edge and other seams have quite a bit of extra on the back. For the most part, this doesn’t matter. When a dark fabric could be seen through onto the right side of a light colored fabric, I made sure to trim the darker fabric in the back. The snow capped top of the mountain was challenging to put together. Mainly because it took reversing the triangles from facing inward in ‘starburst’ patterns method to a new method of triangles facing downward with their pointy ends, I wasn’t sure I would pull it off at first. After picking out many seams as I went along, I finally got the snow angles right. I don’t think I could have finished this mountain if I didn’t love it so much. It’s been so inspiring. I feel like it’s opened up a whole new world of thinking when it comes to colors, solid fabrics and even the piecing of triangles of fabric in such a unconventional way. These fabrics are mainly solid in color, but with a slightly variegated aspect to them. All the colors I needed were available- bonus. The subtle difference in the solids of the mountain fabrics and the ‘shadow play’ background fabrics should be small but significant to the end result. I can’t wait to see the background in place. Stay tuned. 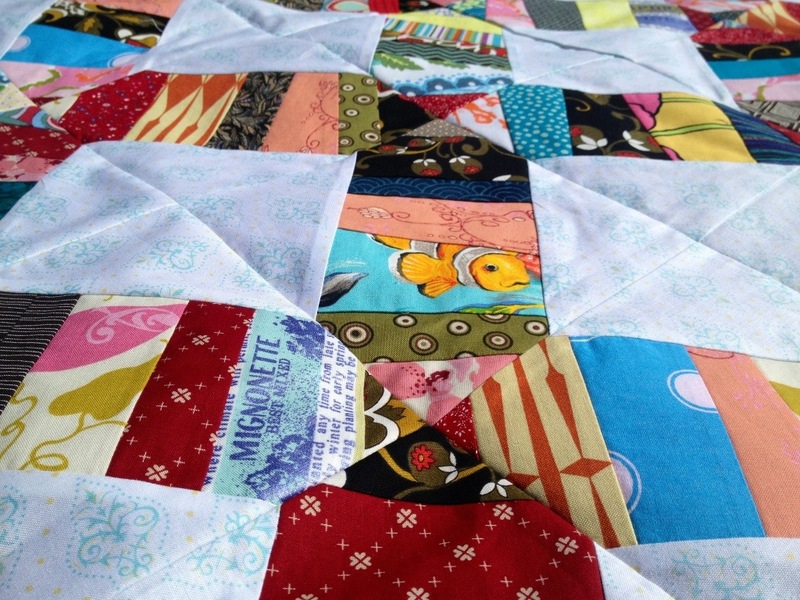 Take a look at the finished quilt here. 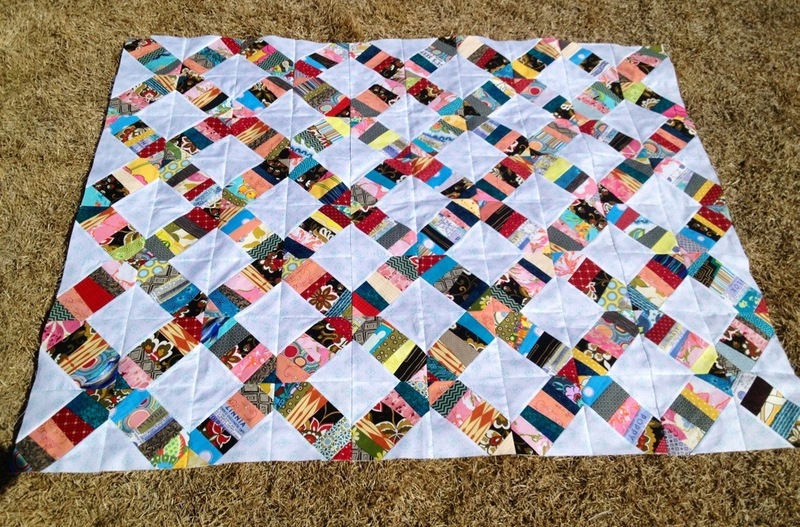 This entry was posted in collage art, design, fabric, projects, quilts, sewing and tagged abstract quilt, colorful mountain, mountain quilt, quilt piecing, quilt piecing triangles, quilting, snow capped peak quilt, solid fabrics quilt, triangles quilt on January 21, 2014 by NoelleOlpin. 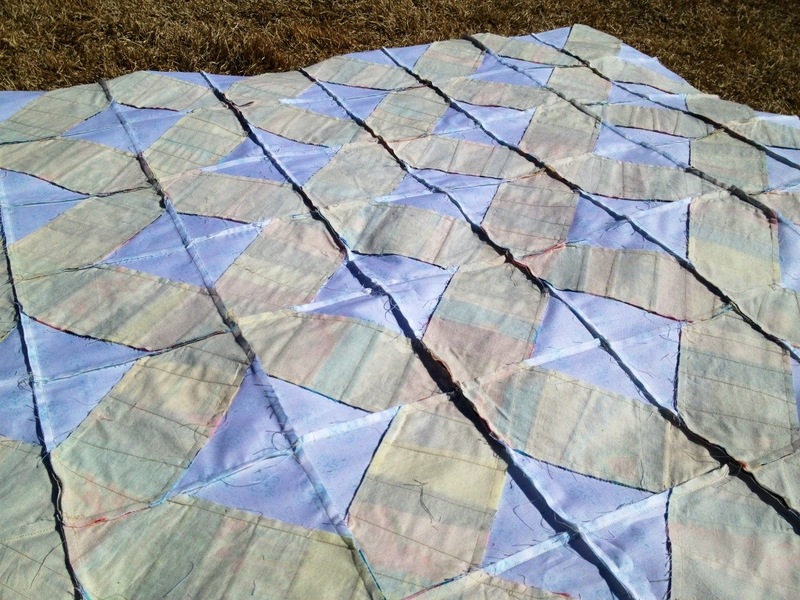 Got the Confetti quilt top all sewn together, now onto the next step of getting it all quilted. It needs to make a plane for delivery to Costa Rica with a friend in a few weeks so I’m under the gun. Having a deadline has been a good thing and given me a sense of accomplishment. I feel less guilty, lazy and slovenly about all the unfinished projects that sit around me yet to be completed (or even started). Little friends helping- we’re fighting the wind here, but enjoying the beautiful spring day. 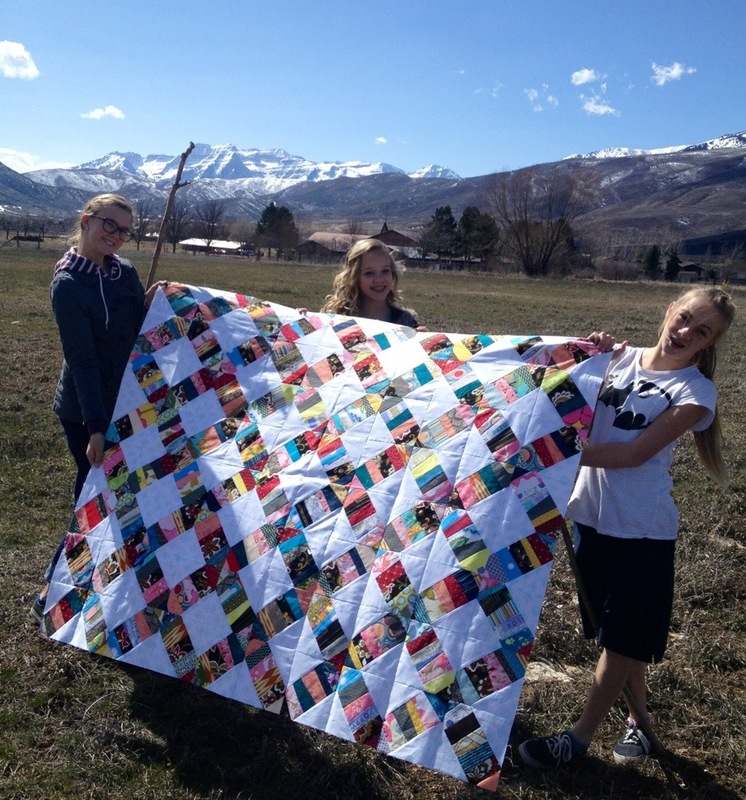 This quilt is for my daughter’s host family, she’s currently on a foreign exchange in Costa Rica. They own a flower business and beautiful greenhouses surround their house (so I’ve been told) so I spread the ‘seed package’ fabric throughout the quilt. Too bad it’s not written in Spanish. Just for reference, here’s what the back of the quilt top looks like, all of the foundations and their triangle companions all sewn together. Here’s the full frontal view on the yellow hibernating-until-just-last-week lawn. The fabrics were literally all scraps (my favorite part, my frugal self is continually haunted by scraps), I ran out of specific fabrics as I went along but there were 2 or 3 fabrics I had enough of to include in every block and achieve some continuity. FYI- I sewed the vertical rows together first (10 in this case) then the 10 sections together, pressing with an iron in between. 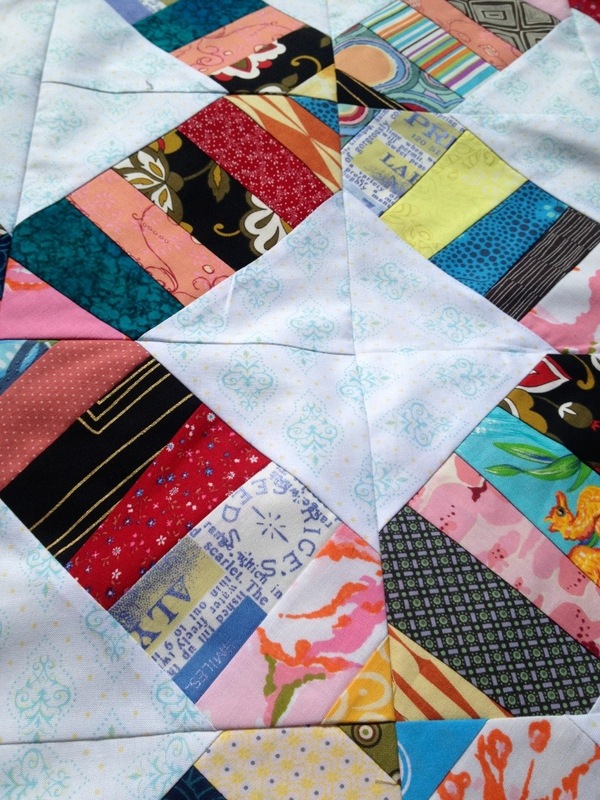 For the full tutorial on foundation piecing and making this quilt look here. This entry was posted in projects, quilts, sewing and tagged confetti quilt, Costa Rica, fabric scraps, foundation piecing, piecing a quilt, quilting, quilting techniques, quilts, scrap quilting ideas, scrappy quilt, sewing on March 17, 2013 by NoelleOlpin.